That’s Life! is a Britain’s leading real-life magazine, it covers all real stories. Buy a single issue of That's Life! £2.57 Buy Now Buy the current issue of That's Life! 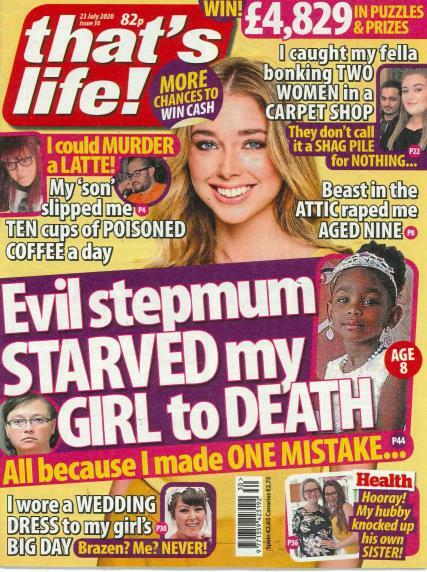 £2.57 Buy Now Buy the next issue of That's Life! Buy a Subscription to That's Life! It is a weekly magazine that comes loaded with most inspirational, emotional, in-depth, interesting, incredible stories about women world and their struggles in real life. All the pieces are so well narrated that it stunned and surprised the readers. It also covers male behaviors. To make the magazine more interesting and fun, it has been added with puzzles, cookery, jokes, heath tips and fashion tips. That’s Life! Manage to capture all age and all gender readers but is published especially for all women of all ages. The magazine has a separate section in which essential and practical expert advice is given on various walks of life. All women who need helping hands can surely depend upon That’s life! Magazine for all solutions! The magazine’s team is hardworking and has keen interest in human related issues. That’s Life! team works hard to give high quality and well written content to their readers. I like everything about this magazine, and have been buying it for a few years now.